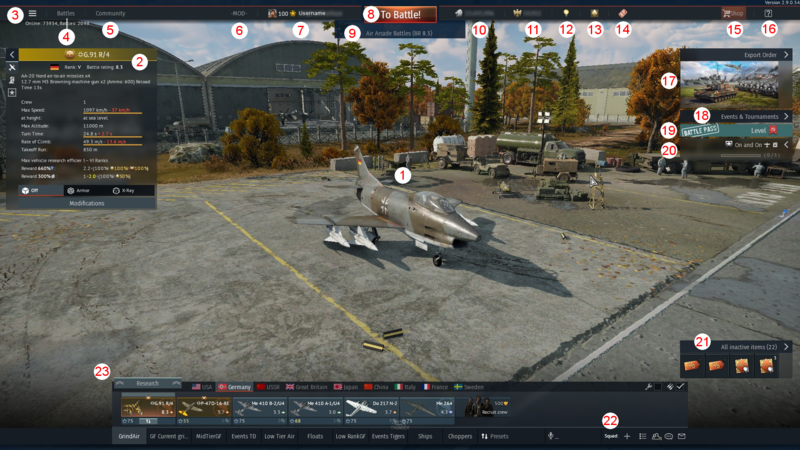 The Hangar/Garage is the main interface of an average War Thunder player where they can manage their vehicles, crew, research, nation tree, and all other functions in War Thunder. The Hangar is laid out that most of the main functions of the game is available to the player with a click of a button. Vehicle Display: The displayed video is the selected one the player has specified on the menu. More details on "Vehicle" Category. Stats Card: This sector displays the details of the selected vehicle in the Vehicle Display. Details range from armaments to the speed of the vehicle. The additional buttons on display give access to the Vehicle’s Info, Crew Info, Armour View, X-ray View, and Modifications. Menu Button: Clicking this button will give access to the menu function. Squadron: This here displays the squadron if the player has joined one. Player’s Profile: Here the player could access their profile and see their in-game statistics such as the number of kills on a vehicle. To Battle! : This important button will send the player into battle of the game mode of their choice. Mode Selection: Players can go here to change their game mode preferences between Arcade, Realistic, and Simulator mode. The player can also choose which server to play on. Convertible RP: This numerical value here displays how much RP is available for conversion using Golden Eagles to boost experience on a vehicle. Silver Lions: This numerical value here displays how many silver lions are available for the player’s spendings. Golden Eagles: This numerical value here displays how many Golden Eagles are available for the player’s spendings. Account Status: This here displays the player’s account status on whether they have premium account or not. A silver diamond indicates a normal status whereas a golden diamond indicates a premium status. Inventory: This will display the items in the player’s disposal ranging from boosts, orders, wagers, and discounts. Shop: This will send the player to the War Thunder store to be able to purchase premium vehicles, gift vehicles, premium accounts, and Golden Eagles. Help: The question mark button will open up an in-game help feature to display the purpose of some of the buttons in the hangar menu. News, Events, Tournaments: This sector here will display any important news, events, and tournaments happening at the moment. Battle Tasks: This sector displays the battle task and its condition to the player to be completed to earn War Bonds. Quick-Access Inventory: This pop-up area gives the player a quick-access to their inventory and allows them to activate boosts, wagers, and discounts. Vehicle Line-Up: The entire bottom sector allows the players to do a majority of their vehicle selection. More in Vehicle section. Chat service provides General chat, Help Desk, Squad Room: which allows individual players to organise a local squad with other players. This also provides, the option for Individual players, squads and clans, to create chat rooms. This sector will cover the Vehicle Line-Up Bar on the Hangar menu. Research Tree: Clicking this button opens the research tree for the nation the player is currently in. In the research tree, the player can view the vehicles available to their disposal, change research allocation, and see what premium/gift vehicles they could obtain. Automatic Repair/Resupply: These two checkboxes are for auto-repair and auto-resupply for vehicles. Having them checked will either automatically repair broken vehicles, resupply used ammunition, or both after a battle. Vehicle Change Menu: The bar underneath the selected crew boxes will allow the player to change the vehicle assignment. It also allows for the training of crew to new vehicles. Going to the very top of the menu can empty the crew box with the “Send to Holiday” option. Crew #1: The first crew in the player’s line-up. The crew boxes, if occupied by a vehicle, will display the vehicle’s name, battle rating, and type, as well as crew skill level on the bottom left and vehicle back-ups on the bottom right. Hovering a mouse over the crew box with a vehicle will also show options for the vehicle.This specific crew box is also highlighted, indicating the player’s selection on this vehicle that would show up in the Vehicle Display on the hangar menu. Crew #2: The second crew in the player’s line-up. Like the first crew box, but it is unhighlighted to show the player has not selected it for the Vehicle Display. Crew #3: The third crew in the player’s line-up. This specific crew box has a vehicle with a spade symbol on the background, this symbol indicates that the vehicle is fully upgraded. Crew #4: The fourth crew in the player’s line-up. This specific crew box has a golden background, indicating the vehicle’s status as a premium/gift vehicle. The symbol on the very top indicates that the vehicle has a talisman enabled. Crew #5: The fifth crew in the player’s line-up. This crew box is unassigned to a vehicle and as such is empty. Crew with vehicles can enter this state by choosing the “Send to Holiday” on the top of Vehicle Change Menu. Recruit Crew: Crew space will allow the player to recruit additional crew for vehicles. After the fifth crew box is unlocked, the rest of the crew that can be unlocked will need Golden Eagles. The player can have a maximum of 10 crew box per nation line-up. Presets: Presets allow for different vehicle line-ups that can be preselected to quickly change the line-up composition. Nation: The selection for nations are done via vertical bars on the left and right side of the line-up bar. These would allow the player to switch between nations. A user preset is a lineup of vehicles, created by the player, that can be "summoned" whenever they so choose. The presets are listed below the vehicles, and (for most nations) come with the default "Ground Forces" and "Aviation" presets. By clicking the presets button to the right, a window will open up. There, you can re-name existing presets, create new ones, and change their order. The number of presets you are limited to is your highest rank (in any nation, both Air and Ground) times two. For example, if your highest rank is 3rd Rank British Aviation, you will be allowed 6 presets for all nations. Preset names are restricted to 15 characters. You can change out which vehicles are in a preset, as long as the preset is selected. Especially for Tank AB, Tank RB and Air AB, since you can take out multiple vehicles into battle, you should coordinate the Battle Ratings of the vehicles in each preset. With update 1.59, it is possible to create a custom hangar. Further details can be found on the "Custom hangar" page. This page was last edited on 7 January 2019, at 18:54.